Over the past decade, India's urban middle class people which comprise of the one fourth of the entire Indian population of 1.3 billion have been getting thrashed by skyrocketing healthcare costs. Arranging money for medical expenses is a nightmare for most urban Indians at the moment as it can potentially impoverish them in no time. Some stats regarding medical costs are actually frightening. According to WHO, rising cost of diagnosis, hospitalization and medicines push a significant proportion of total India's population below poverty line for out-of-pocket expenditure in healthcare. The worse part is any additional onus on already flooding medical expenses would put a huge percentage of Indian families into the category of being financially-vulnerable. Therefore, the total percentage of vulnerable families rises from 30% to almost 86% in case they have the liability of an extra load of Rs. 1 lakh for medical expenses. President Pranab Mukherjee expressed his deep concerns by saying that it is utterly shocking that a staggering 4 crore people of India become impoverished for spending too much on medical treatment each year. How do Indians try to cope with this burning issue? Surveys have shown that most Indians consider savings is the only way of managing funds in time of emergencies. Almost 60% Indian families focus on savings to deal with medical emergencies. About 50% people from Metro cities admitted that they save money for healthcare costs on priority. The most alarming fact to be revealed in the survey is between 8-9% of families had reportedly taken loans to manage their medical costs. Why do Indians have to go through this ordeal? Public spending is extremely low on health in India. The expenditure is a dismal 1% of GDP which puts India among the bottom 20% of countries across the world. Until the middle of the 1980s public healthcare centers such as hospitals played pivotal roles in offering quality treatment facility at a much cheaper rate than private healthcare providers. However, since early 1990s the private sector had come to the forefront. Of late, spending on health in private sector amounts to over 80% of total health expenditure in India and this is considered as one of the highest part of private expenditure across the world. India is one of the top countries in terms of private expenditure on health which is around 4% of the GDP. Of this, employers account for around 9% of expenditure, health insurance accounts for about 10% and the rest of over 82% is personal expenditure on healthcare. 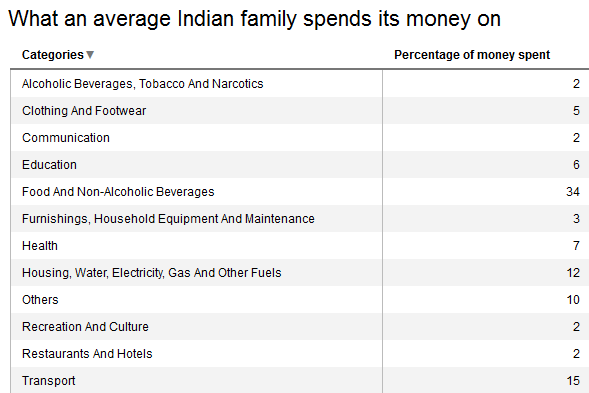 Not only Indians spend most on health personally but they also spend mostly from their own pockets. India is one of the top countries in the list of countries with out-of-pocket expenditure on health. Only 33% of Indian health care expenditures are from government sources. 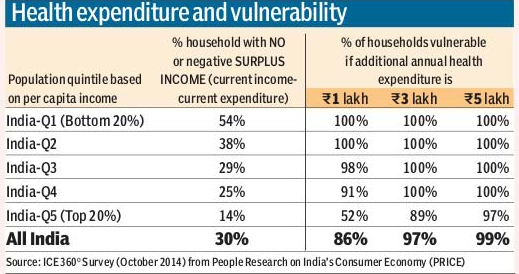 Around 86% of private expenditure on health is out-of-pocket. This shows how government’s meagre spending on healthcare impose financial constraints on patients as well as on their families. A comprehensive health insurance in India is the best bet against ever-increasing healthcare costs. Alternatively, you can increase your savings on health care. However, it takes time to accumulate large savings and more often than not, you will find that allocation of more funds for future expenses on health care is possible only at the cost of something else. Therefore, availing a health insurance policy is lot better option for you. But you have to ensure that your chosen health cover is good enough to take care of inflation of medical expenses. Here is what you need to do to be armed with an adequate health insurance policy in India. It is always wise to opt for more than enough coverage, ideally more than Rs.10 lakh because 10 years down the line Rs.10 lakh of today will be valued arounf Rs.6-7 lakh. In essence, you need to calculate the entire coverage amount, after taking the future costs of various treatmnts into account. Secondly, you should look to protect your entire family through one health policy. Almost all health insurance companies in India offer plans with family floater option. This is a cost-effective option as well as you have to pay just one premium for all the members of your family and the total coverage amount can be utilized by anyone of the family included in the health plan. Again, while choosing the amount, keep the inflation in mind. To provide adequate protection to yourself and to your family from medical inflation, it is prudent to avail the health cover early in life, ideally by 35 years. This way you will be done with the waiting period at younger age. Moreover, if you get yourself and your family insured early, you can easily avoid tests and exclusions. Even after buying a health insurance plan online, you should review the cover as per your changing needs in every 3-4 years. 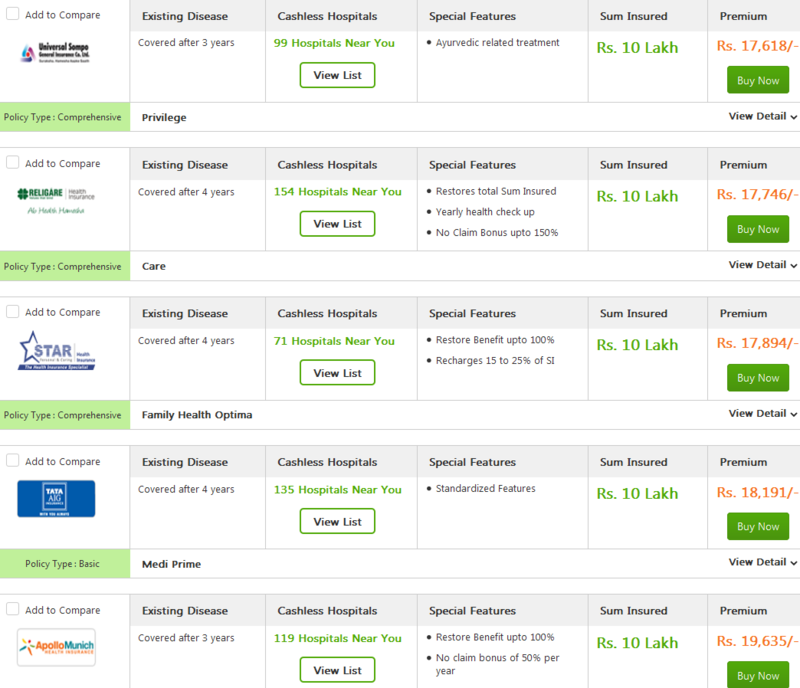 Finally, you need to compare health insurance plans on various parameters. You can weigh various health insurance providers in terms of hospital network, sub-limits, critical illnesses coverage, maternity coverage coverage and come up with the best set of insurers after leaving out the lesser beneficial options. Even though, some of these factors do not shield you directly from healthcare inflation but will certainly help you reduce your unforeseen costs. A health insurance plan with such features is little more expensive but an inexpensive and inadequate health plan is the last thing you want when you need it to work in your favour. Most leading health insurance companies in India are armed with health policies with with family floater options and comprehensive coverage over Rs.5 lakh. Here is a list of top 5 health insurance plans for a family of 4 people; a 35 years old male, his 30 years old spouse and two children who are 7 and 5 years old living in Mumbai. The chosen coverage amount is Rs. 10 Lakhs keeping the future costs of treatments in mind. When earning members of families were asked what is their biggest reason of woes, about half of all members pointed “personal and family health”. Around 46% respondents cited healthcare as their major concern. Just 34% families in India said that they meet their medical expenses with ease. Almost half of Indian families admit that they manage their healthcare cost with “some difficulty” while 14% of all Indian families confessed that that had “great difficulty” in arranging money for medical emergencies. The sheer difficulty in meeting medical expenses is a common scenario in Indian households. And, the only feasible solution is health insurance policies with adequate coverage. Although, several public health insurance schemes exist in India in the form of insurance for state-level employees and health care plan for civil servants of central government. Many reputed private companies also offer health policies employee. But these initiatives are far from being enough and as a result just 10-15% of entire India's population are armed with health insurance coverage.